17 Hereford is located on the west side of Hereford, between Beacon and Marlborough, with 15 Hereford to the north and 363 Marlborough to the south. 17 Hereford was built in 1872-1873, one of four contiguous houses (13-15-17 Hereford and 363 Marlborough). 13-15-17 Hereford were numbered 1-3-5 Hereford through about 1879. The land on which 13-15-17 Hereford and 363 Marlborough were built was part of a larger parcel purchased on June 12, 1868, from the Boston Water Power Company by Daniel Davies, a housewright and carpenter. He and his wife, Amity Bacon (Hastings) Davies, lived at 131 Mt. Vernon until the early 1870s, when they moved to 445 Beacon. Click here for an index to the deeds for 17 Hereford, click here for a plan of the original land, and click here for further information on the land on the north side of Marlborough between Hereford and Massachusetts Avenue. Silas Merrill purchased the lot on which 17 Hereford was built on March 13, 1872, and resold it and the lot for 15 Hereford to John Richardson on November 30, 1872. On November 1, 1873, 17 Hereford was purchased from John Richardson by Frances A. (Beals) Baker, the widow of George Baker. By 1874, it was the home of Frances Baker’s son and daughter-in-law, George Livingston Baker and Margaret Armistead (Appleton) Baker. They previously had lived at 23 Pinckney. He was a dry goods commission merchant. They continued to live there in 1875, but moved thereafter to Pennsylvania. The property remained in the Baker family for the next thirty-five years, primarily leased to others. By 1876, 17 Hereford was the home of Joseph Prince Hawes and his wife, Ellen M. (Hall) Hawes. He was a stock auctioneer and broker. Their adult children lived with them: Joseph Prince Hawes, Jr., Ellen M. Hawes, and Edward H. Hawes. Joseph Hawes, Jr., was a dealer in spices, dyestuffs, and fertilizers. He married in October of 1877 to Anna C. Marsh. After their marriage, they moved to 398 Beacon. Joseph and Ellen Hawes and their unmarried children continued to live at 17 Hereford in 1878, but by 1879 had moved to 341 Marlborough. During the 1878-1879 winter season, 17 Hereford was the home of Frances (Beals) Baker. She moved soon thereafter, possibly to New York City. 17 Hereford was not listed in the 1880 and 1881 Blue Books. By the 1881-1882 winter season, 17 Hereford was the home of Jonathan Howard Hasbrouck, Jr., a salesman, and his widowed mother, Hannah (Chester) Hasbrouck. In 1880, they had lived at 368 Dudley. They continued to live at 17 Hereford during the 1882-1883 season, but moved thereafter, he to the Hotel Oxford (southeast corner of Exeter and Huntington), and she to the Hotel Huntington (Huntington at Blagden). By the 1883-1884 winter season, 17 Hereford was the home of Frank Everett James and his wife, Gertrude (Woodworth) James. He was a banker with the firm of Richardson, Hill & Co.; his senior partner, Spencer Welles Richardson lived next door at 363 Marlborough. In 1884, the Jameses were joined at 17 Hereford by Gertrude James’s father, Alfred Skinner Woodworth, a tea importer, and her brother, Arthur Vernon Woodworth, who was a clerk at Richardson, Hill & Co. Gertrude James’s mother, Anna Gorton (Grafton) Woodworth, had died in September of 1883. Also living with Frank and Gertrude James in 1885 was his brother, Edward Preston James, whose wife, Carrie (Piper) James, had died in December of 1883. They continued to live at 17 Hereford during the 1885-1886 winter season. 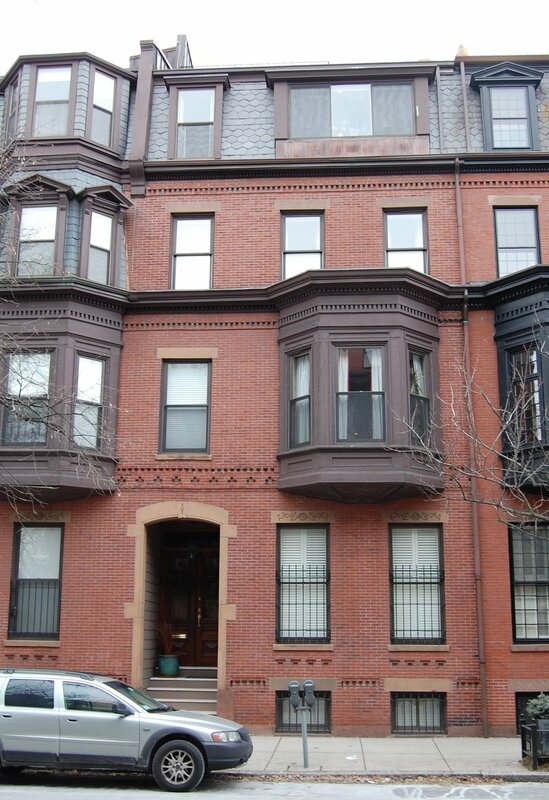 In 1886, Frank and Gertrude James moved to Brookline, and Edward James moved to Monadnock. Alfred Woodworth remarried in October of 1886 to Mrs. Sara E. (Campbell) Tucker and they moved to the Hotel Vendome. Arthur Woodworth moved elsewhere. By the 1886-1887 winter season, 17 Hereford was the home of Sewall Henry Fessenden and his wife, Louisa Green (Bursley) Fessenden. They had lived at 155 Beacon during the previous season. Sewell Fessenden was agent for the Boston and Sandwich Glass Company. They continued to live at 17 Hereford in 1889, but had moved to 49 Hereford by 1890. 17 Hereford was not listed in the 1890 Blue Book. By the 1890-1891 winter season, 17 Hereford was the home of Rev. George Sherman Converse and his wife, Ella (Coles) Converse. They previously had lived at 98 Cedar in Roxbury. George Converse was an Episcopal clergyman. He had served as rector of St. James’s Church in Roxbury and then of St. John’s Church in Boston Highlands. He died in November of 1895. Ella Converse continued to live at 17 Hereford until about 1899, after which she lived in Dedham..
During the 1899-1900 winter season, 17 Hereford was the home of Arthur Marsh Merriam and his wife, Margaret Elizabeth (Coleman) Merriam. They also maintained a home in West Manchester. 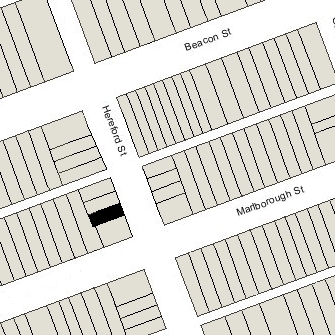 By the 1900-1901 winter season, they had moved to 453 Marlborough. 17 Hereford was not listed in the 1901 and 1902 Blue Books. By the 1902-1903 winter season, it was the home of Mrs. John (Catharine L.) Mahoney. She previously had lived at 911 Boylston. She continued to live at 17 Hereford in 1904. The house was not listed in the 1905-1907 Blue Books. Frances Baker had died in December of 1897 in New York City, and 17 Hereford had been inherited by her four children: Ella Frances Baker, Marie Antoinette (Baker) Davis, the wife of Fellowes Davis, George Livingston Baker, and William Beals Baker. Marie Antoinette Davis acquired George L. Baker’s one-fourth interest in 17 Hereford on December 14, 1897, and acquired the interests of William B. Baker and his wife, Sarah Frances Baker, on May 25, 1907, and June 30, 1908. Ella Baker died in October of 1908 in New York City, and on September 9, 1909, Marie Antoinette Davis acquired her interest from her estate, thereby completing her full ownership of the property. Fellowes Davis and Marie Antoinette Davis lived in New York City, where he was a stockbroker. They continued to lease 17 Hereford to others. By the 1907-1908 winter season, 17 Hereford was the home of Col. William Roscoe Livermore and his wife, Augusta R. (Keen) Livermore. Col. Livermore had served in the Army Corps of Engineers, where he worked on a variety projects, including fortifications and river, lighthouse, and harbor improvements in the Northeast and in Missouri, and surveying in the Great Lakes and Texas. He also was an inventor, having developed an improved bell-striking device for lighthouses and, with Col. A. H. Russell, a method for loading firearms by clips and magazines. Marie Antoinette Davis died in December of 1909, and on March 23, 1910, Fellowes Davis transferred 17 Hereford to their daughter, Marie Antoinette (Davis) Johnson, the wife of Ralph Miller Johnson. They lived in New York City, where he was general agent for the Chicago and Northwestern Railroad and later would become a textile executive and then a stockbroker in his father-in-law’s firm. The Livermores continued to live at 17 Hereford during the 1917-1918 season, but moved thereafter He died in July of 1919 in New York City. 17 Hereford was not listed in the 1919 Blue Book. By the 1919-1920 winter, 17 Hereford was the home of cotton merchant Robert Whitman Means and his wife, Alice Frances (Hubbard) Means. They previously had lived in Beverly Farms, where they continued to maintain a residence. They continued to live at 17 Hereford during the 1920-1921 season, after which they moved to Beverly Farms. By the 1921-1922 winter season, 17 Hereford was the home of Charles Belknap and his wife, Helen (Rockwood) Belknap. They previously had lived at the Hotel Kenmore at 496 Commonwealth. They also maintained a home in North Andover. Charles Belknap was vice president of the Merrimac Chemical Company. In about 1928, he was named president of the firm and the same year it was acquired by Monsanto. They continued to live at 17 Hereford in 1928, but had moved to the Hotel Hamilton at 260 Clarendon by 1929, and later lived in St. Louis, where he became president of Monsanto in 1943. Marie Antoinette Johnson had died in October of 1926, and on July 14, 1928, 17 Hereford was purchased from Ralph M. Johnson by Edna Winifred (Dailey) Miner, the wife of Dr. Leroy Matthew Simpson Miner. He was a dentist, dean of the Harvard Dental School, and a professor at Harvard Medical School. They lived in Newtonville. The Miners also owned 363 Marlborough, next door, which they had converted into medical offices in the late 1920s. On June 1, 1971, 17 Hereford and 363 Marlborough were purchased from Robert Miner and Richard Miner by Bernard Yudowitz and Arthur H. Rosenberg. On June 3, 1971, they transferred the property to themselves and Martin Goldman, and on September 6, 1972, Bernard Yudowitz and Martin Goldman acquired Arthur Rosenberg’s interest. In December of 1973, they applied for (and subsequently received) permission to convert 17 Hereford and 363 Marlborough from medical offices and one apartment into eleven apartments. On October 15, 1980, the Marbo Corporation (Paul G. Roiff, president and treasurer) purchased 17 Hereford and 363 Marlborough from Bernard Yudowitz. In June of 1981, it applied for (and subsequently received) permission to convert the properties from eleven apartments into nine apartments.